1) You can become a reseller affiliate a make a 20% recurrent monthly commission on clients you refer to us. 2) You can buy yearly PIN memberships at a very discounted price and resell them at your own price. 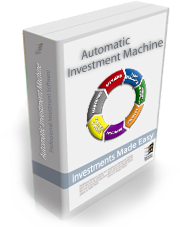 3) A step further would be to have your own Private Label of Automatic Investment Machine that will bear your own software name and would let you control the big right screen (on the main screen) where you can make you own cross sell and up sell offers and to provide information to your customer and more.